A Preprocessor is a script that pre-populates a Custom Field with dynamically generated data. Use a Preprocessor when you need to collect Lookup Values in a Custom Field where those values might change over time or under certain circumstances. A Custom Tool that needs to have a dynamically populated field will call a separate Custom Tool to get that information. 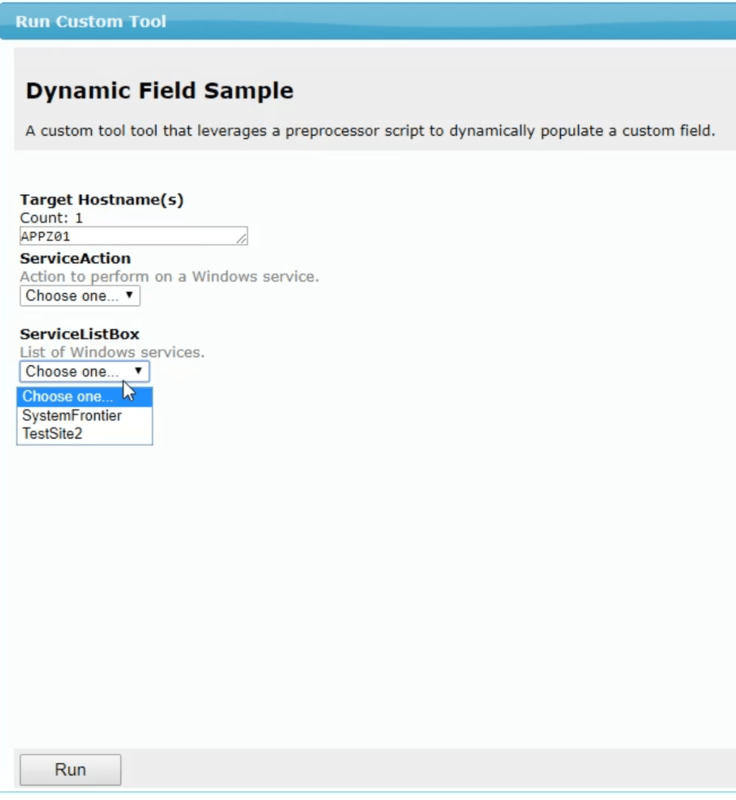 Ergo, in the example below, on the Custom Tools page (Tools > All tools), you’ll see the Preprocessor tool called, Preprocessor Sample, and the parent Custom Tool called, Dynamic Field Sample. If we take a look at the parent Custom Tool below, we’ll see that the Script/Executable refers to the script that needs to run the action desired. ServiceAction. Lookup Values of: View, Stop, and Start. ServiceListBox. No Lookup Values because this User Input Field will use a Preprocessor to fill in those values. There is a section labeled Preprocessor. In the dropdown box, we’ll select the script that we want to run that will populate the Lookup Values for the ServiceListBox input field. The Preprocessor will run before the parent Custom Tool’s form loads, so the values will already be populated in the ServiceListBox field when it loads. 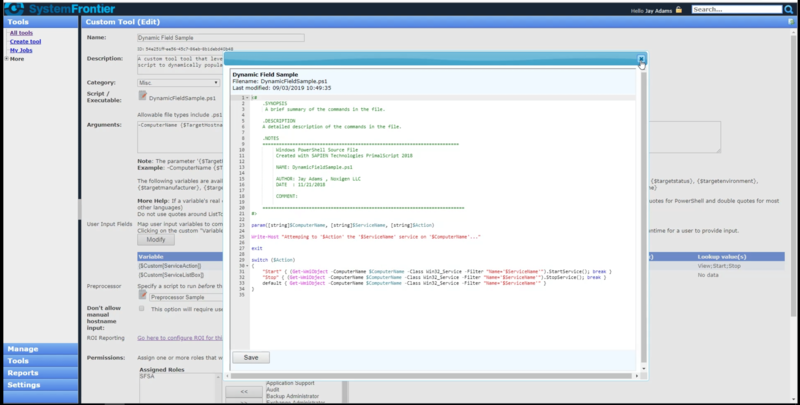 In the actual Script/Executable script, in this case DynamicFieldSample.ps1, you’ll see on line 23 below that it takes as inputs: a computer name, a service name, and a service action. A Preprocessor script will collect data that’s needed to create the ServiceListBox values and convert that data (usually stored as an array) into JSON. 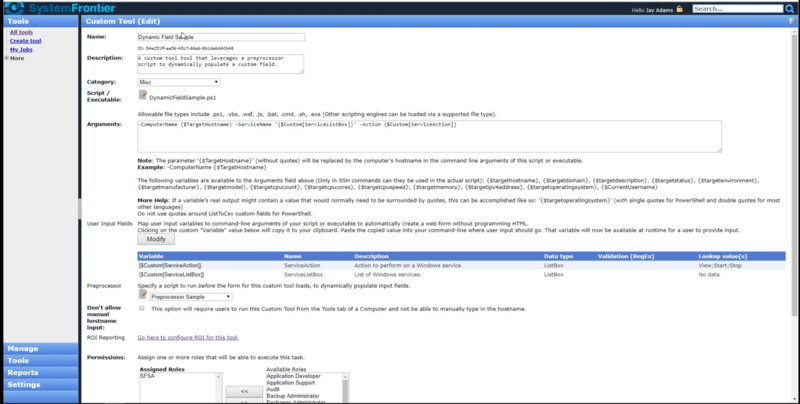 System Frontier converts the JSON into the Lookup Values used in the parent Custom Tool. Be sure to read the Custom Fields article for more information. 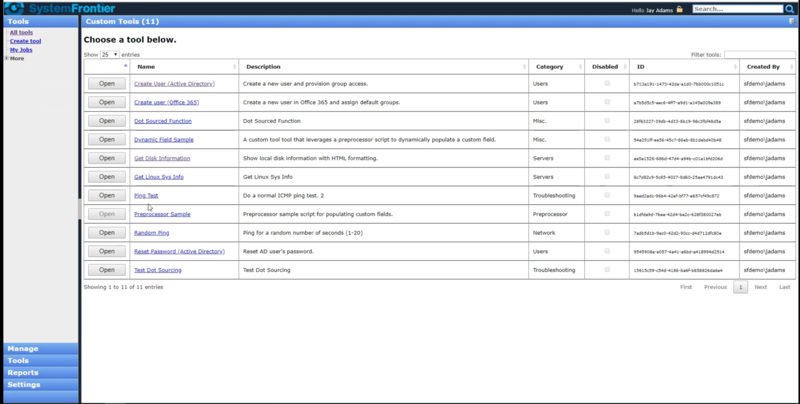 The Dynamically populate Custom Tool fields with Powershell article will give more specifics and describe how to create the Preprocessor Custom Tool.